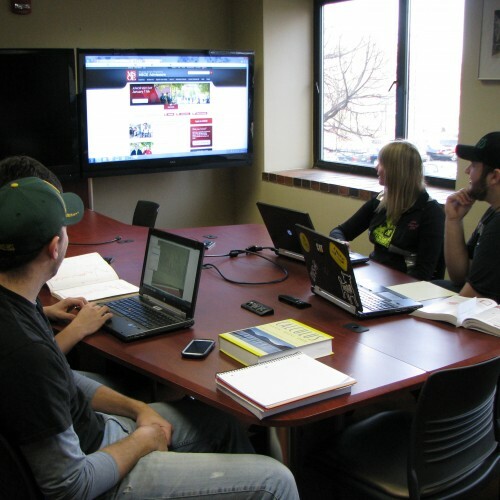 Our inviting, service-oriented MSOE Library is here for your educational, professional and social information needs. 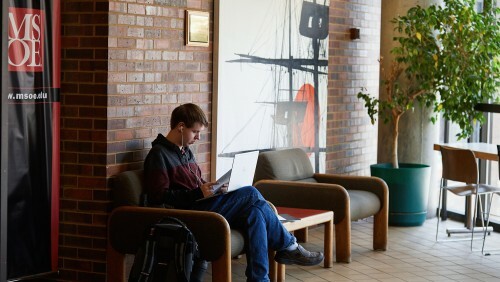 Gather in groups to exchange ideas in spaces that encourage collaboration or focus on your own in a quiet study area. Go beyond Google by using our resources to discover nearly 300,000 print and electronic books and access more than 100,000 electronic journals full of millions of scholarly articles. Visit us virtually or in person to connect with our friendly, knowledgeable librarians who are here to help you succeed. The Schroeder Library underwent a recent makeover. 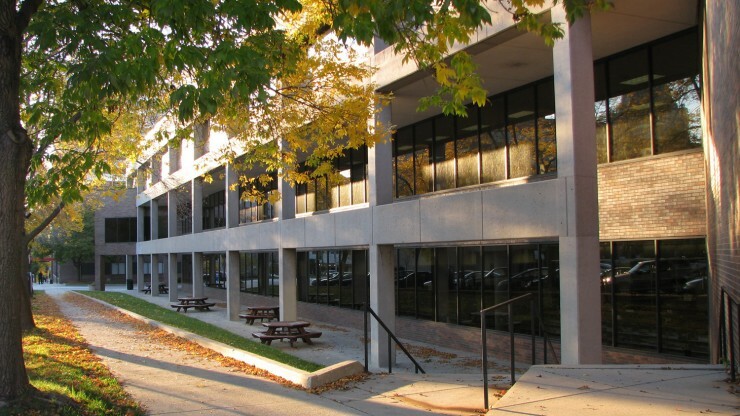 Improvements included a new entrance atrium to the building, new carpet and paint, and creation of several specialized work zones. Virtually the entire print book collection was relocated to create a large collaboration area. For more information about this makeover please view the renovation page under "Library News" above! 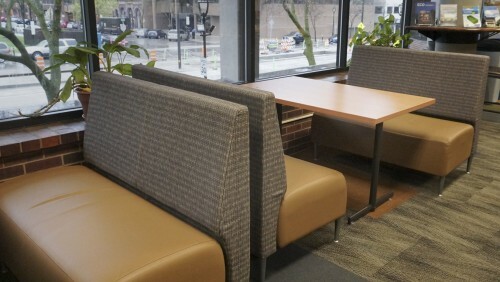 Collaborative work zone featuring banquette style seating. 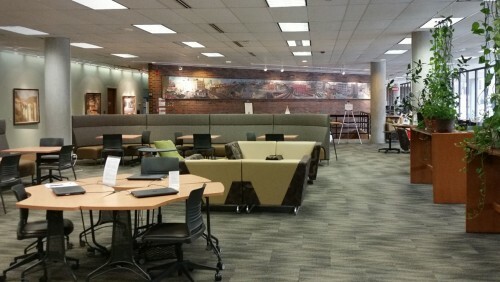 New booth seating along the windows in the Library’s collaborative work zone. 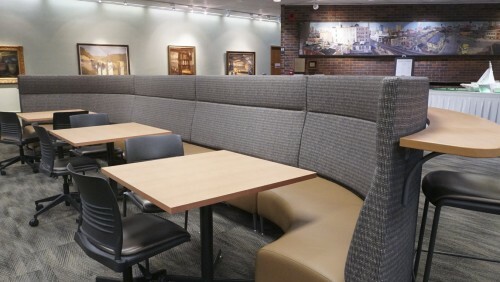 Library collaborative seating area including new artwork from the Grohmann Museum was installed. One of the highlighted pieces seen in the background is “The Walker’s Point Pan,” by Michael Newhall, a nine-panel panoramic view of Milwaukee, 42 feet in length. Part of the Library’s new entrance atrium. 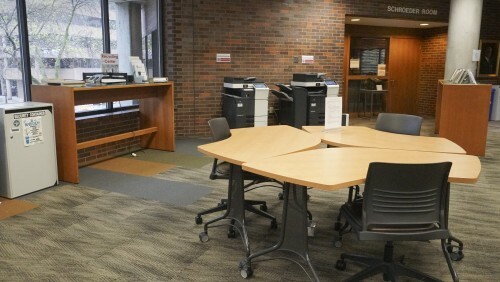 This student work area features moveable seating, a copier and a color printer, and basic trimming and binding equipment. The Schroeder Conference Meeting Room (top right) includes state-of-the-art instructional technology including video conferencing, lecture capture, presentation capture, and AirMedia connectivity. Subject guides and useful resources compiled by your friendly librarians. Book a study room for a private space to collaborate on a project. Find information on library services and resources. 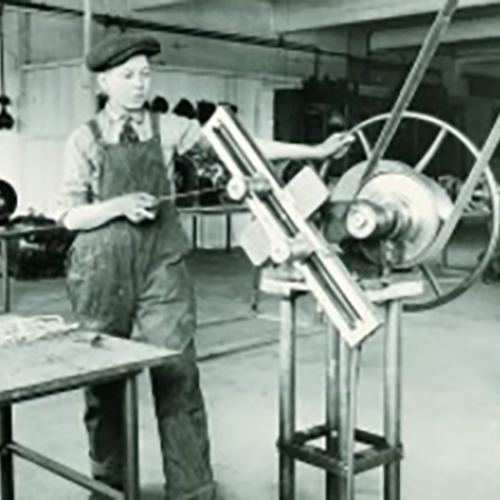 Browse through historical items that document MSOE's past. 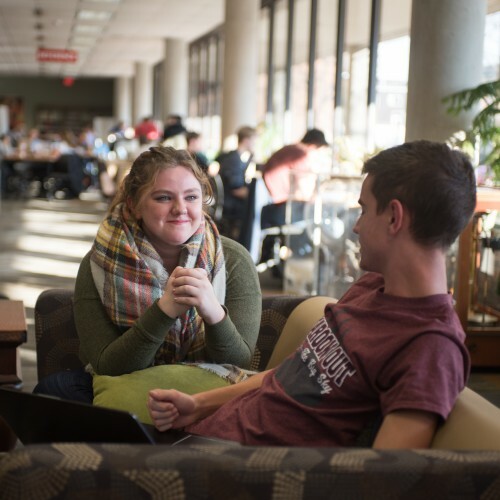 RCAS is located in the library and provides academic assistance through tutoring, writing help and study spaces to keep you on track academically.